The month of November is part of the post-monsoon festive season across India. Auto manufacturers usually see a rise in sales around this period. This is especially true for two-wheeler manufacturers. However, market leader Hero saw only a minor increase (0.82 per cent) in total sales for November 2018. While TVS posted a 26 per cent growth in November 2018, Suzuki Motorcycle India’s total sales grew by almost 14 per cent year-on-year in November. November was a great month for Bajaj as its total sales increased by an impressive 31 per cent compared to November 2017. Here’s a detailed breakdown of the sales performance of each manufacturer for November 2018. Hero MotoCorp, which is the largest two-wheeler brand in India, sold 6,10,252 units in November 2018, in comparison, sales in 2017 stood at 6,05,270 units. Although positive, the low growth rate can be attributed to the price increase that resulted from the change in insurance regulations before the festive period. The new regulations mandated compulsory third-party insurance for all new two-wheelers sold, which pushed up the final cost by a significant margin. Hero continues to derive most of its sales volumes from entry-level models like the Splendor series and the HF Deluxe. Bajaj posted an extremely healthy growth rate of 45 per cent in its domestic sales for November 2018. The Pune-based bikemaker sold 2,05,259 motorcycles in the month, which compares favourably with the 1,41,948 units the company sold in November 2017. The impressive sales performance was also replicated in the company’s overseas numbers, whereby its exports grew by 16 per cent compared to October 2018. In absolute figures, Bajaj exported 1,41,285 units in November compared to 1,22,022 units in October. Entry-level offerings, namely the CT 100 and the Platina, form a bulk of the company’s sales. 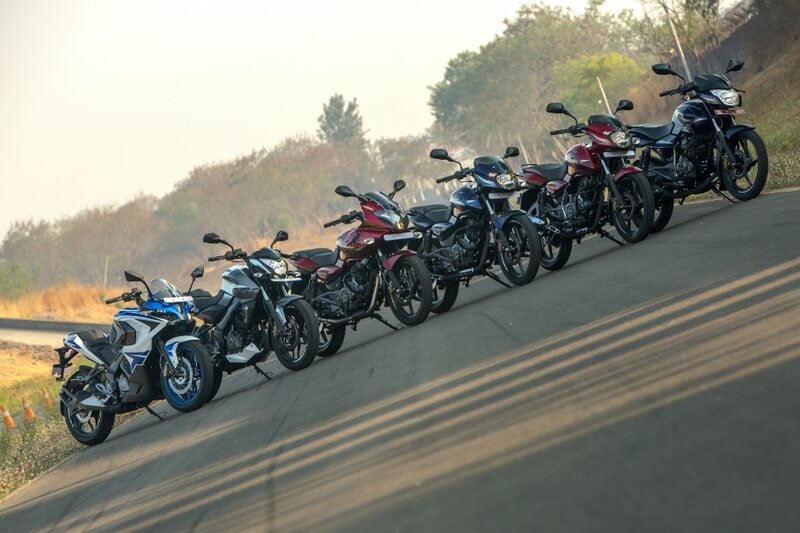 TVS sold a total of 3,07,142 two-wheelers in November 2018, which represents a hike of 26 per cent over the 2,43,323 units the company sold in November 2017. In the domestic market, the Hosur-based company sold a total of 2,60,253 units in November 2018 as compared to 2,03,138 units in November 2017. As for motorcycles, TVS sold 1,19, 883 units in November 2018 compared to 93,202 units in November 2017. The company’s sales performance saw the greatest improvement in the scooter segment. A total of 1,11,763 TVS scooters were sold in November 2018, which is a 43 per cent increase over the 78,397 units the company sold in November 2017. TVS also exported 46,889 two-wheelers in November 2018. In November 2017, the company had exported 40,185 two-wheelers. Suzuki’s domestic sales in November grew 24 per cent year-on-year on the back of new launches and a refresh of its existing product lineup. The company sold a total of 53,058 units during November 2018 compared to the 42,722 units it had sold in November 2017. The Japanese brand’s combined (domestic + exports) figures stood at 56,531 units for November 2018, which is 13.86 per cent more than the 49,647 units it sold in November 2017. The company also reported year-to-date figures that were in-line with its 2018-19 FY sales goal of 7.5 lakh units. In the period between April and November 2018, Suzuki sold a total of 4,93,329 units. Royal Enfield sold a total of 65,744 motorcycles in the month of November 2018, which is a decline of 6 per cent compared to the 70,126 units sold in November 2017. The company’s exports fell by 69 per cent as it exported only 718 units in November 2018 vis-a-vis 2,350 units in November 2017. In the domestic market, the company sold 65,026 units in November 2018. For the same period last year, it sold 67,776 units. Royal Enfield attributes the fall to the strike at its Oragadam facility that lasted from 24th September 2018 to 12th November 2018. According to the company, this strike represented a total loss of production of 28,000 motorcycles. However, with the deliveries of the Royal Enfield 650 twins expected to commence shortly, the company is confident about registering positive sales figures in the coming months. Honda sold a total of 4,18,362 units in the month of November, 2018. In the domestic market, the company sold 3,94,241 units in November. Honda also exported 24,121 units in the same period. For the YTD period (April to November, 2018), it sold a total of 44,63,054 units, which is 5 per cent more than the 42,55,388 units it sold in the same period a year ago. The export performance was even better as Honda shipped 2,82,017 units compared to 2,39,219 units in Apr-Nov last year. This represents a growth rate of 18 per cent.